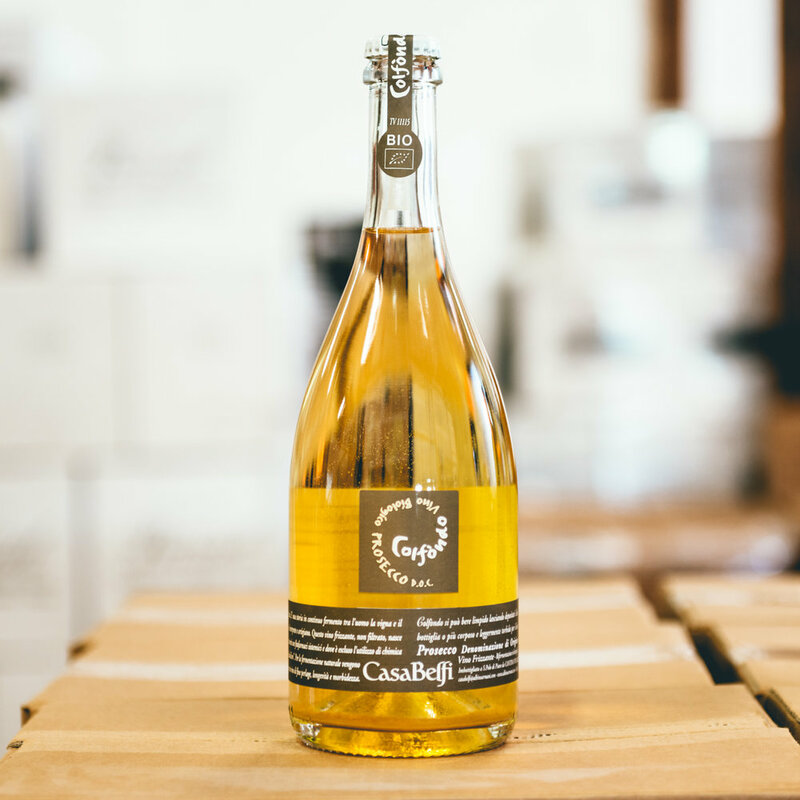 Key facts: This certified-organic Prosecco finishes its alcoholic fermentation in bottle (under a crown cap!) which creates a wine that is at once rich and bone dry. Method of fermentation: stainless steel with indigenous yeast. Cooled using well water. Six months of lees contact prior to bottling. First impressions of Casa Belfi. We met at the end of a rainy winter day. After dark. After a long ride through the richly monochromatic vineyards of Valdobiaddene. Before arriving at Casa Belfi we’d experienced a life-in-a-day in the wine trade, beginning with an expansive Venetian lunch (fried fish, cheese melting into mounds of polenta) sprawling out into a tour of a massive technology-filled Prosecco-making warehouse, followed by a stop at the residence of an octogenarian artist, an elegant white-haired Italian from Trieste whose first fortune was made in the coffee trade. Hours drifted by as we wandered through rooms of an estate that struck me as lyrical, timeless, woven together with an aesthetic thread that pushed the place from stodginess toward artful classicism. We studied volumes of Italian poetry, goaded each other to play the piano, appreciated the kodachrome color-saturated modernist paintings of our host, eventually wandered outside to survey his expansive vinous territory. Later on our journey there were ghost stories, tipsy friends, and a penultimate hike to a pay-what-you-want unstaffed “restaurant” on top of a hill, a woodsy warm hut inhabited by a cluster of locals, well-lubricated by the nearby Prosecco vending machine. It was the spot that picnic dreams are made of, up a vertigo-inspiring path surrounded by staked vines, just remote enough. Maurizio Donati is the improbable character that you meet at the end of this day. His outlandish appearance on our arrival made sense in this surreal version of reality: a clean-cut technician would have been laughably out of sync with the tall tale unwinding around us. Maurizio smiled warmly, his right eye covered in a patch from a very recent pruning injury. His resemblance to Renaissance Jesus is widely accepted in these parts. We rechristened him pirate Jesus on the spot. There’s corroborating evidence. Donati is a carpenter. His seemed to be followed everywhere by a small herd of lazy friendly large dogs. Locals seem to be in awe of him. If only he had a parrot and a tall ship. The winery feels remote, isolated. Outside and in there are amphorae, evidence of Maurizio’s growing fascination with giant clay vessels for fashioning ever more evocative sparkling wine. The wines at Casa Belfi are scrupulously natural. There is a complete absence of chemical products in the production of the col fondo Prosecco that we import. Donati pays attention to the biodynamic calendar. The wines are fermented using indigenous yeast. Long lees contact (approximately six months) is the norm at this estate. The final fermentation for Donati’s Prosecco occurs in bottle, pushing residual sugar levels down to a scant 1gram/liter and alcohol levels up to a very brunch-friendly 10.5%abv. The wine is unfined, unfiltered, made to be drunk hazy or decanted off the sediment: your preference. It’s far too late/maybe it’s not even that late. On a winter day where darkness fell at 5pm and our relentless guide had filled our minds with every conceivable fact and anecdote about Conegliano/Valdobaiddene, the last hour at Casa Belfi felt like midnight. Our friends tried to soak up every drop of wine in the room, ignorant of the obvious: you can’t drain a winery of alcohol. We shepherded them to a temporary home on the outskirts of Venice, and traveled onward, secure that the day had yielded at least one great new wine for our portfolio. The creative spark and deep understanding of wine that lives in Maurizio Donati will bring other distinct wines our direction in years ahead. The cobwebby corner of my brain that cares about wine (the only part where cognitive activity really happens) clamors for a next visit to Casa Belfi. I have vivid daydreams of brilliant future wine. But I need to get a little rest first: stamina is necessary for repeating this journey.